Basic Information: What are Ultra Rx-Joint Tablets? We take a look at the Nature’s Plus Triple Strength Ultra Rx-Joint Tablets and give you a detailed review of its strengths and weaknesses. This product claims to offer a unique and reliable way to remedy joint pains such as arthritis as it mixes in a special ingredient into an already tried and tested formula. If you wish to learn more about this particular product you can check our full review below. Recommended dosage for adults is for two tablets taken twice daily. However, if you wish for a higher dosage you can also opt to take four tablets twice every day. Four tablets twice a day is the dosage limit for this supplement so remember to stay within that limit to prevent any negative side effects caused by overdosing. One bottle of Nature’s Plus Triple Strength Ultra Rx-Joint Tablets contains around 120 tablets and is available for $40.95. We checked around their official website and found no discounts available at the moment. This product is available via their official website as well as through well-known online stores. We found no cases of side effects to using this product. However, some complaints did catch our eye while researching for this review. There are cases where no positive effects were felt during the duration of use and there is one case wherein their arthritis problems seemed to worsen after using this product. While these cases are few and far between it is still important be cautious when taking any type of new medication. To prevent aggravating the problem, please consult with your doctor first before trying out new medications or supplements. The official website does mention a 100% consumer guarantee but returns or refunds are not stated. Before purchasing this product you should contact them through their customer support and inquire of their return policy. We do have to give them props for their reputation for quick delivery and complete delivery. Overall, the Nature’s Plus Triple Strength Ultra Rx-Joint Tablet is quite a unique and specially made joint support supplement that further expanded on the formula by adding two special ingredients. Is it effective? Yes. It is also quite fast acting and offers round the clock relief from arthritis. 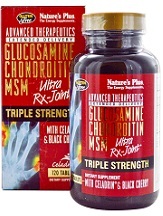 There are a few cases of customers experiencing no relief and one that claims that this product exacerbate his arthritis so it is still best to consult your doctor first before trying out this muscle and joint pain relief supplement.